The	Coming Pan-European Sovereign Debt Crisis – introduces the crisis and identified it as a pan-European problem, not a localized one. The	Pan-European Sovereign Debt Crisis: If I Were to Short Any Country, What Country Would That Be.. – attempts to illustrate the highly interdependent weaknesses in Europe’s sovereign nations can effect even the perceived “stronger” nations. did savor being waited upon like a king. Only at the end of the meal did he look up and notice a hand sharpened sword hanging directly above his head by a single strand of horse-hair. 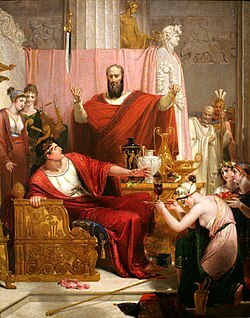 Damocles immediately lost all taste for the amenities of royalty, pomp and circumstance and asked leave of the tyrant, saying he no longer wanted to be so “fortunate” [adapted from Wikipedia].Little did Damocles realize that what he experienced was of value, significant value. He simply failed to recognize the value as he has blinded by the fair maidens who served him hand and foot. The moral to this BoomBustBlog telling of the Sword of Damocles is that: “When one sits on the Throne, the true value of the sword is not that it falls, but rather, that it hangs.” Recent history has given weight to this moral as Greece has fed high on the hog for nearly a decade, while being totally oblivious to the value held within that single strand of horse hair, protecting it. Till this day, that strand, although dwindling, has yet to snap. “The worst of Greece’s financial crisis is over and other European nations won’t follow in its path, said former European Commission President Romano Prodi. Reggie says “Liar, Liar, Pants on Fire”. In all seriousness, while I don’t truly believe Mr. Prodi is lying, he is also obviously ignoring the facts as they currently exist, whether purposefully or in error. Let’s walk through a few excerpts from the most recent addition to the Pan-European Sovereign debt crisis. BoomBustBlog subscribers can download the full15 page analysis here, which contains more than enought evidence to throw serious doubt on the ability of Greece to come anywhere near their stated goals: Greece Public Finances Projections 2010-03-15 11:33:27 694.35 Kb/.The report also makes clear why Germany is so hesitant to contribute funds to a Greek bailout. The revenue measures include increasing tax rates, reducing tax evasion and some one-off measures while the expenditure measures consist of salary reduction, freezes in hiring and salary hikes as well as cutting other public sector expenditures. According to the Stabilityand Growth Program, January 2010, the government is aiming to reduce its fiscal deficit from 12.7% of GDP in 2009 to 8.7% in 2010. However, if the impact of the additional measures that were estimated at 2.5% of GDP is also added, the fiscal deficit is expected to come down to 6.2% of GDP in 2010, based on government’s estimates. The government further envisages additional proceeds from the sale of stakes in some of the government-owned entities as well as proceeds from the payback of financial assistance provided to the Greek banks, which will be used to reduce the massive government debt of around 113% of GDP in 2009. However, there is strong evidence to support the assertion that the budgeted impact of these measures is grossly overstated, since a) The Greek government’s base case scenario for the economy is overly optimistic when compared with analyst expectations, and b) the dynamics of the announced measures shall lower the total projected impact. The Greek government’s base case scenario builds in GDP growth of -0.3% and 1.5% in 2010 and 2011, respectively, which is simply unrealistic vis-à-vis analyst expectations. A recent Reuters poll revealed consensus estimates for GDP growth of -1.5% and 0.5% in 2010 and 2011, respectively. Local subject matter experts such Gikas Hardouvelis, Chief Economist at EFG Eurobank and professor of economics at the University of Piraeus are expecting a deeper recession with GDP declining 2.8% in 2010. Deeper recession and delayed recovery is expected primarily on the back of reduced private and public consumption as a result of the government’s austerity measures. Economic performance lower than the government’s estimates will result in lower tax base and lower tax revenues, and shall consequently offset the projected impact of the revenue measures like increase in tax rates. Evidence of this is already apparent in the ability of Greek labor unions to shot down much of Greece during 24 hour strikes which effectively eliminate large swaths of revenue and productivity for the day. Tax collectors, customs inspectors, the police, doctors, teachers… The striking populace apparently encompasses a very broad swath. This has happened several times in the last month and several future strikes are planned as well. The Greek government’s macroeconomic assumptions also seem overstated when compared with EU estimates. 1. Friedrich Schneider, chairman of the department of economics at the Johannes Kepler University. – Greece’s unreported — and untaxed — shadow economy is one of the largest and equals about one-quarter of GDP. That compares with 22% of GDP in Italy (keep in mind that this is inclusive of the evasion performed by the famed La Cosa Nostra as well as the lesser known Camorra, the ‘Ndrangheta or the Sacra Corona Unita, as well as foreign organized groups) and 20% in Spain and Portugal, according to his estimates. 2. Bloomberg – Prime Minister Papandreou says that the Greek workers and companies have skirted tax worth € 31 billion, more than 10% of GDP. According to EU statistics, Greece’s revenue from income tax was 4.7% of GDP in 2007, compared with an EU average of 8%. Tax revenue fell 2.5 percentage points of GDP between 2000 and 2007 to a Euro region-low of 32% even as economic growth averaged 4.1% a year. 3. Analyst Ed Sollbach, Desjardins Securities – Tax evasion in Greece is a huge problem. Nearly 94% of personal income declared relates to annual incomes of less than € 30,000. 4. Matsaganis, Hellenic Observatory, The European Institute – Under-reporting of income in Greece is estimated at 10%, resulting in a 26% shortfall in tax receipts. Announced expenditure measures are expected to cut the government’s expenditure by nearly € 8.1 billion or 3.3% of GDP. Expenditure measures include salary cuts, freeze in hiring and salary hikes, as well as cuts to other public sector expenditures. The government is planning to procure funds by offloading stakes in some of the government owned entities, and plans to raise € 5.6 billion or 2.3% of GDP over the next three years, with € 2.5 billion planned to be raised in 2010. In the Stability and Growth Program, the government has outlined a list of companies in which the government owns equity, and gave estimates of values of the government’s equity stakes. We back-calculated the government’s estimates for total equity of the companies and compared the same with the current market values (market cap) of the total equity of the companies and observed that in most of the cases the government’s estimates were overstated (and in some cases, drastically) when compared with the current market value. It can be argued that the Greek government is factoring in a control premium for their majority holdings. Theoretically this is acceptable, but realistically this will be very difficult to translate into cash. The government would have to find large buyers who are willing,to purchase the entire stake at the premium suggested, from a seller who is in obvious and globally publicized distress – and the Greek government will have to do this several times over, all within a period of less than 8 months to meet the 2010 deadline. We find this to be highly unlikely. It has been our experience that distressed seller’s often take DISCOUNTS to the market value of their assets, not PREMIUMS! Below, you can find a sample from the Greece Public Finances Projections 2010-03-15 11:33:27 694.35 Kb/ report that should visually drive the point of overvaluation home. Ironically, mismarkng the value of its assets is what contributed to Lehman Brothers downfall. The Greek government has accumulated significant debt over the years to finance its annual fiscal deficits. The government debt has risen from 97.1% of GDP in 2006 to 113.4% of GDP in 2009. The implications of this massive debt are reflected in its overwhelming interest burden which has precipitated its current weakened fiscal situation – all of which culminates into high sovereign risk. This creates a feedback loop, and self-devouring cycle that increases the interest costs on debt roll-over and new issuance in the market which again adds additional burden to the weakened Greek fiscal situation that requires additional funding at ever higher interest rates. The Greek government is trapped in a vicious circle where the interest expense as well the primary deficits are adding to the debt levels which itself goes on to increase the interest expense. While the government is aiming to reduce its debt in the coming years by generating primary surplus (through austerity measures) as well as by collecting funds from the privatization and payback of financial assistance package, this is expected (by us) to yield much lower proceeds than budgeted, in light of the observations mentioned above. Originally published at BoomBustBlog and reproduced here with the author’s permission.